The Sentier Notre-Dame, Kapatakan pilgrimage trail is located in the Saguenay–Lac-Saint-Jean region of Quebec. When friends inquired about the destination of my upcoming trip to Quebec, I replied, “The name of the place is so French that I don’t even want to TRY to pronounce it.” It seemed somehow glamorous to be headed to a place so exotic that I feared slaughtering the pronunciation of “Saguenay Lac Saint Jean” with my meager French, which I admit “c’est une catastrophe” (is a disaster.) The pronunciation of Lac Saint Jean is “pas de problem” since I mastered the pronunciation of Saint-Jean-Pied-du-Port after numerous Caminos that brought me through that French village near the foot of a pass “pied du port” in the Pyrenees Mountains. But the “Saguenay” had me tongue tied. The 215 km (133.5 mile) pilgrimage trail weaves its way through spectacular north central Quebec from the Parc national du Fjord-du-Saguenay (Saguenay Fjord National Park) to L’Ermitage Saint-Antoine de Lac-Bouchette in lake country. In this fairly short distance, pilgrims find a variety of stunning landscapes. First passing over high granite cliff walls along the magnificent Saguenay Fjord and later following waterways to manicured urban river walks, hikers complete their journey in lush boreal forests that fringe serene lakes. Starting point: Notre-Dame-du-Saguenay statue in Saguenay Fjord National Park. Ending point: Notre-Dame-de-Lourdes at L’Ermitage, which is one of Quebec’s five National Shrines. Stages/Etapes: The Sentier Notre-Dame, Kapatakan website, suggests 10- and 14-day itineraries. The Statue Trail led me up and over granite cliffs to Notre-Dame-du-Saguenay, a nine-meter (30-foot) tall statue of the Virgin Mary that overlooks the Saguenay Fjord. The fjord’s sheer size makes it the only navigable fjord in North America. I hiked up stone steps, cedar staircases and glacier-polished bedrock to overlooks above the vertical cliffs to view the shimmering water below. The enchanted pathway was lined with dark green spruce and white-barked birch, and I relished the quiet punctuated by the chirp of a woodpecker. The calming green environment on the first day of the pilgrimage is perfect for meditating and peeling off the cloak of stressful city life. Notre-Dame-du-Saguenay and the Statue Trail, where you start the pilgrimage is located in Saguenay Fjord National Park. In the nearby town of Rivière-Éternité, 17 km away, pilgrims can find accommodation in the dormitory or private rooms at Auberge du Presbytère at Rivière-Éternité, a municipal albergue in a renovated rectory. Here you may purchase a Pilgrim Guide that includes the Pilgrim Credential. Other accommodations, including camping, are available and listed on the website. Tip: Procure your guide and credential at Auberge du Presbytère at Rivière-Éternité before you head off to the park, 1.5 km away, so you can get your credential stamped at the park’s information center. Depending on your itinerary, the town of La Baie is probably where you will sleep on your third night. This picturesque town is a port for cruise ships coming from NYC or Boston. Because this area has so much to offer, passengers must choose from a wide variety of shore excursions including a walk in the National Park from which you’ve just come, ‘La Fabuleuse,’ an exhilarating, live cultural stage show, or a visit of the Fjord Museum, a fascinating, experiential attraction. Of course, you don’t have to be a cruise passenger to see these delights. You might want to take the day off from walking to take in some of the local culture and natural splendors. Tip: I ate at La Grange aux Hiboux for a satisfying taste of the local French Canadian cuisine. Try the chomeur, a true Quebecoise staple of moist white cake laced with maple syrup. The proprietors also rent rooms with views of the bay. L’Ermitage Saint-Antoine de Lac-Bouchette (St Anton Hermitage and Shrine) is a retreat center founded and managed by the Capuchin Franciscan religious order. The Notre-Dame-de-Lourdes is located on the sprawling campus and is the end point of the Sentier Notre-Dame, Kapatakan pilgrimage route. The Grotto of Lourdes and a scaled replica the Lourdes Massabielle Chapel enhance the wooded setting, truly an oasis of peace and calm. The natural environment is part of Franciscan spirituality, and so programming at the retreat center links spirituality to nature. Pilgrims can walk the footpaths surrounding the hermitage where words from St Francis’s The Canticle of the Creatures are posted to encourage private meditation on our Christian’s connection to nature. Tip: Reserve one or two extra nights at L’Ermitage Saint-Antoine de Lac-Bouchette which offers chalets (cabins,) private guest rooms and camping. You’ll be able to take part in the nature programs facilitated by Capuchin Brother Sylvain Richer, daily masses and other traditions that will help you process your pilgrimage. The retreat center has its own bakery, restaurant where you can eat a communal dinner in a fraternal atmosphere and museum of the 110-year-old hermitage. 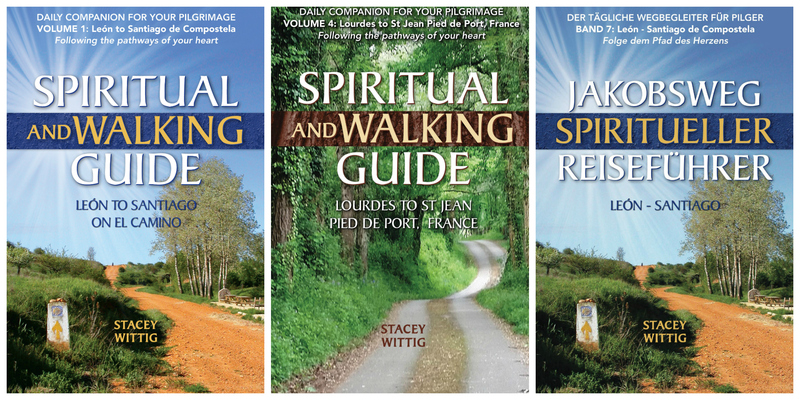 Stacey Wittig is a spiritual adventurer and Camino author who blogs from her home near Flagstaff, Arizona. The Arizona travel writer was hosted on this trip to Quebec and although all her opinions are her own, she believes in full disclosure. Thank you #QuebecOriginal and Saguenay–Lac-Saint-Jean #saglac.